All Handoffs Are Not the Same: What Perioperative Handoffs Do We Participate in and How Are They Different? Q&A: Should Transdermal Drug Patches Containing Metal Be Removed During Procedures Using Electrocautery Because of the Risk of a Burn Injury? ASA/APSF Featured Session: Postoperative Infections: Can the Anesthesia Provider Be at Fault? Reprinted with permission from Anesthesia & Analgesia 2017;125:347–350. DOI: Copyright © 2017 International Anesthesia Research Society. All rights reserved. Matthew Weinger, MD, and Maria Van Pelt, PhD, CRNA, co-chaired the APSF Conference on Distractions In the Anesthesia Work Environment: Impact on Patient Safety. Distractions in the perioperative work environment can adversely affect vigilance, situation awareness, and the ability to respond promptly to changes in the patient’s condition and pose a risk to patient safety. The Anesthesia Patient Safety Foundation (APSF) believes that the role of all types of distractions and their potential adverse effects need to be addressed through open discussion, education, research, policy, and possibly other interventions. To make progress in this area, APSF convened a conference entitled “Distractions in the Anesthesia Work Environment: Impact on Patient Safety” in Phoenix, AZ, on September 7, 2016, comoderated by the authors. Robert Stoelting, APSF immediate past president, welcomed over 100 participants who represented anesthesia professionals, surgeons, operating room (OR) and perioperative nurses, the nuclear power and surface transportation industries, and risk management. The goals of the conference were to (1) delineate the most important types of external and self-induced distractions occurring in anesthesia professionals’ different work environments, (2) identify those distractions most likely to pose patient safety risks (i.e., high-risk distractions), and (3) develop recommendations for decreasing the incidence of high-risk distractions and to reduce the risk to patient safety when distractions of all types occur. The conference started with a series of informational presentations by diverse stakeholders with associated audience response polls, followed by panel discussions and small group breakout sessions. When considering distractions, a distinction should be made between those that are externally imposed and those that are internally motivated. External distractions, which derive from many sources, can be patient care-related (e.g., a device alarm, repositioning the patient for the surgeon) or unrelated to patient care (a nurse asking about your weekend). When an external distraction has disrupted ongoing thoughts or actions, it is an interruption. The anesthesia professional can choose to immediately react to, defer responding to, or ignore external distractions. Internal distractions, those initiated by and under the complete control of the anesthesia professional, may be patient care-related (e.g., looking up lab results on the electronic medical record) or patient care-unrelated (texting a friend about dinner plans). Expert panelists field questions from the audience at the APSF Conference on Distractions In the Anesthesia Work Environment: Impact on Patient Safety. From Left to Right: David Gaba MD, Jason M. Slagle PhD, Neil H. Cohen MD, MPH, Matthew Weinger MD, and Kristin L. Chrouser MD, MPH. There are limited data available on the role of distracted behavior causing patient harm. The American Society of Anesthesiologists Closed Claim database reports 10 (of 5822) injury claims related to distraction in the operating room (OR).1 The majority of these claims included reading printed materials, phone calls, and loud music. Distractions inherent in the clinical work we do can be related either to the current case or another (previous or future) patient. They are more likely to be externally created and thus often present as an interruption. David Gaba (Stanford/VA Palo Alto) suggested that such distractions were an important source of patient safety risk. For example, unpredictable breaks in care continuity can compromise prospective memory, which puts clinicians at significant risk for lapses in vigilance and missing or delayed responses to critical activities. He stressed the importance of considering “attention allocation” when evaluating the impact of interruptions and distractions. Matt Weinger (Vanderbilt/ VA Tennessee Valley) noted that a prior study had shown the potential “attention consumption” of the intraoperative use of transesophageal echocardiography by primary anesthesia care professionals.2 Jason Slagle (Vanderbilt) presented as yet unpublished new observational data demonstrating a combined 54% prevalence of patient care- and nonpatient care-related distractions; externally distracting patient care activities were more commonly related to nonroutine events than personal or educational distractions. Weinger emphasized the high distraction risk from technology failure and usability problems. In several studies, technology has been a contributor to about 40% of all anesthesia non-routine events. Technology can cause distraction when it fails or is unavailable, is time-consuming to use (e.g., health information technology), is mentally absorbing to use (e.g., total energy expenditure),3 or interrupts workflow (e.g., false alarms).4 David Reich (Mount Sinai) described the electronic health record as a source of distraction because of increased connectivity and access to information, the misalignment of technology demands and clinical workflows, and increased time demands for often low-value data entry. Cohen underscored the excessive data entry requirements in non-OR environments, often as much as 3–4 hours of additional “documentation time,” and the distractions and misinformation that can result from workarounds for HIT-induced inefficiency, such as indiscriminant cutting and pasting of information from prior encounters. Many of the presenters mentioned excessive noise as a significant distraction. Joseph Schlesinger (Vanderbilt) noted the finding that 85%– 99% of alarms do not require clinical intervention.5 The high frequency of false alarms and clinicians’ responses to address them can be a significant distraction. He also addressed the impact of unmodulated music and the lack of oversight that anesthesia professionals have in regulating play, particularly during critical periods of care. Linda Groah (Association of periOperative Registered Nurses) noted that the average noise levels in the OR (66 dB) routinely exceeded Environmental Protection Agency-recommended thresholds (45 dB) and could be even higher during some surgical procedures.6,7 Schlesinger highlighted the dangers of alarm fatigue, the effort required to differentiate true from false alarms, and the safety compromising behavior of those who inappropriately adjust alarm thresholds or volumes. The absence of clinician input and standardized, evidence-based design criteria in the development of the technology user interface were noted to be common causes for these high-risk distractions. 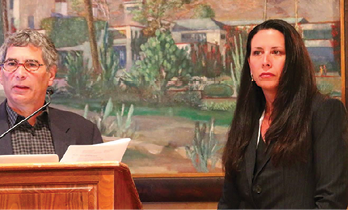 Several speakers described how individual’s disruptive behavior, failures of teamwork, and an OR culture that is not conducive to safe practice all facilitate significant distractions that adversely affect patient safety. David Birnbach (University of Miami) reinforced how a hostile work environment can adversely affect anesthesia professionals’ situational awareness, communication, and teamwork. The presence of hierarchical gradients has been shown to exacerbate distractions through fear of speaking up and poor prioritization of care activities.8 Lynn Reede (American Association of Nurse Anesthetists) described distraction dynamics as an interplay of personal, environmental, and team-related elements. She stressed the negative impact on safe patient care of inattention to staff wellness, a toxic culture, or practice standards that do not address vigilance and distraction management. Slagle and Groah highlighted the increasing contribution of personal electronic devices (PEDs) to distraction. PEDs have been added to ECRI’s list of Top Ten Health Technology Hazards.9 Groah also noted the infection risk that PEDs pose when handled in proximity to sterile areas, as well as Health Insurance Portability and Accountability Act-related confidentiality concerns when accessing and sharing sensitive information. David Hoyt (American College of Surgeons) reinforced the PED contribution to noise and distraction, particularly when used for nonemergent and nonpatient care activities. Richard Thomas (Preferred Physicians) provided a medicolegal perspective on PEDs, noting that vigilance is a stated cornerstone of anesthesia practice and that defense-favorable verdicts were unlikely when PED use was introduced as evidence for lack of vigilance, irrespective of purpose. He stressed that PED usage data were discoverable, and that consequences of PED-related plaintiff verdicts went beyond compensatory damages, including licensing sanctions, National Practitioner Data Bank reporting, and unfavorable media coverage. Some presenters discussed distractions affecting different roles and occurring in different environments including nonmedical domains. Kristin Chrouser (University of Minnesota) noted the high prevalence of distractions of our surgical colleagues, ranging from 14 to 33 distractions per case.10 Many of these distractions were related to lapses in teamwork and communication, equipment and instrument problems, excessive noise, and resident training. 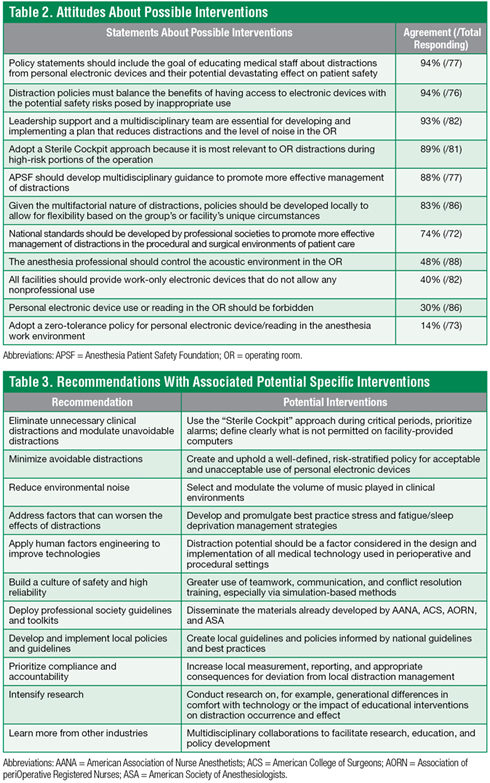 Hoyt highlighted the distractive potential of environmental noise, traffic in and out of the OR, surgical equipment, phones, alarms, and misguided music. Neal Cohen (University of California, San Francisco) pointed out that we understand less about distractions in non-OR anesthesia environments such as interventional procedure areas and intensive care units. Distracting conditions in non-OR anesthesia locations can be accentuated by the different patient populations served, less familiar and less standardized care processes and environments, ill-defined roles and responsibilities of team members, and communication challenges inherent to these locations. Analogies between patient care and driving were made by David Strayer (University of Utah). Sixty-six percent of the more than 31,000 US car crash fatalities each year are related to distractions that occurred within 6 seconds before the accident.11 He showed that humans do not actually multitask, but rather, in 98% of individuals, the brain switches between activities even if they are on different “channels” (e.g., auditory and visual).12,13 Task switching was less efficient than focused attention on a single task, and in driving studies, secondary tasks were significant distractions to successful driving.14,15 Strayer shared research that texting while driving induced a very high task workload, decreasing attention for the longest time (compared, e.g., with telephone conversations) and resulting in performance decrements that were more significant than driving while drunk.16–18 Bruce Hallbert (Idaho National Laboratory) showcased the nuclear power industry’s intense focus on mitigating all sources of distraction, particularly in the main control room. The nuclear power industry supports a formal national program in distraction discovery, management, and reduction. Control room operators are not allowed to have any PEDs while on-shift and instead are issued highly controlled devices that support only allowed work. He underscored the risk of becoming complacent with distraction management when there is a misperception of workplace stability and safety. Based on the presentations, small group breakout sessions, subsequent discussions, and audience polling (Tables 1 and 2), this diverse group of stakeholders put forward a broad portfolio of recommendations (Table 3). In summary, departmental and OR leaders may see the greatest return-on-investment by focusing change efforts on restricting the personal use of PEDs in the OR through policies and culture change. In parallel, there is benefit to addressing provider fatigue, workplace violence and disruptive behavior, and technology-related distractions. Click here to see these figures on pages 41 and 42 of the pdf of the Newsletter for clearer images. Maria Van Pelt, PhD, CRNA, is affiliated with the CRNA School of Nursing Bouvé College of Health Sciences Northeastern University Boston, MA. Dr. Matthew B. Weinger, MD, is Professor of Anesthesiology at Vanderbilt University Medical Center Nashville, TN. Neither of the authors have any disclosures with regards to the content of the article. Domino KB, Sessler DI. Internet use during anesthesia care: does it matter? Anesthesiology 2012;117:1156–1158. Weinger MB, Herndon OW, Gaba DM. The effect of electronic record keeping and transesophageal echocardiography on task distribution, workload, and vigilance during cardiac anesthesia. Anesthesiology 1997;87:144–155. Fraind DB, Slagle JM, Tubbesing VA, et al. Reengineering intravenous drug and fluid administration processes in the operating room: step one: task analysis of existing processes. Anesthesiology 2002;97:139–147. Cvach M. Monitor alarm fatigue: An integrative review. Biomed Instrum Technol 2012;46:268–277. Environmental Protection Agency. Section 3: Rationale for identification of levels of environmental noise requisite to protect public health and welfare. In: Environmental Protection Agency, ed. Information on levels of environmental noise to protect public health and welfare with an adequate margin on safety. Washington, DC: US Printing Office; 1974. Healey AN, Primus CP, Koutantji M. Quantifying distraction and interruption in urological surgery. Qual Saf Health Care 2007;16:135–139. Sevdalis N, Hull L, Birnbach DJ. 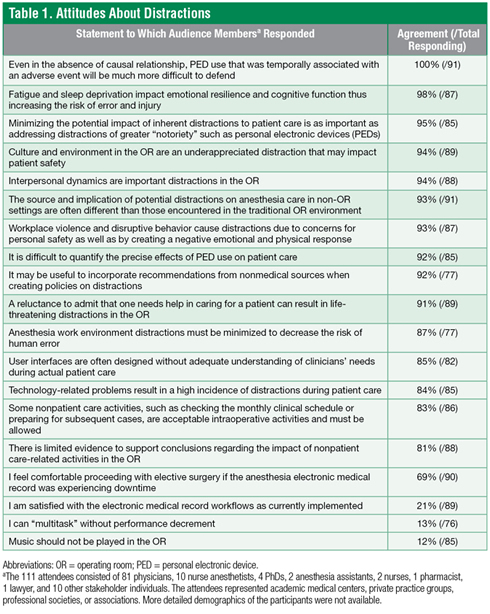 Improving patient safety in the operating theatre and perioperative care: obstacles, interventions, and priorities for accelerating progress. Br J Anaesth 2012;109;i3–i16. ECRI Institute. ECRI Institute announces top ten health technology hazards for 2015. Alarm hazards: inadequate alarm configuration policies and practices. 2014. Available at: https://www.ecri.org/press/Pages/ECRI-Institute-Announces-Top-10-Health-Technology-Hazards-for-2015.aspx. Accessed September 2, 2016. Healey AN, Sevdalis N, Vincent CA. Measuring intra-operative interference from distraction and interruption observed in the operating theatre. Ergonomics 2006;49:589–604. Carney C, McGehee D, Harland K, Weiss M, Raby M. Using naturalistic driving data to access the prevalence of environmental factors and driver behaviors in teen driver crashes. AAA Foundation for Traffic Safety 2015:1–71. Watson JM, Strayer DL. Supertaskers: profiles in extraordinary multitasking ability. Psychon Bull Rev 2010;17:479–485. Medeiros-Ward N, Watson JM, Strayer DL. On supertaskers and the neural basis of efficient multitasking. Psychon Bull Rev 2015;22:876–883. Strayer DL, Turrill J, Cooper JM, et al. Assessing cognitive distraction in the automobile. Hum Factors 2015;57:1300–1324. Strayer DL, Cooper JM, Turrill J, et al. Talking to your car can drive you to distraction. Cogn Res Princ Implic 2016;1:16. Strayer DL, Drews FA, Crouch DJ. A comparison of the cell phone driver and the drunk driver. Hum Factors 2006;48:381–391. Strayer DL, Cooper JM, Turrill J, et al. Smartphones and driver’s cognitive workload: a comparison of Apple, Google, and Microsoft’s intelligent personal assistants. Can J Exp Psychol 2017;71:93-110. Drews FA, Yazdani H, Godfrey CN, et al. Text messaging during simulated driving. Hum Factors 2009;51:762–770.